Souvik hails from Guwahati, Assam. He completed his graduation from M.S. Ramaiah College of Law, Bangalore (BA. LLB) in 2005. Souvik joined ALMT Legal in the year 2005 after completing his graduation. His corporate practice includes advising and assisting corporates and promoters in private equity investments, mergers and acquisitions, cross border corporate structuring and capital market transaction. He has advised clients in international offerings before AIM (Alternative Investment Market) in London. He has advised numerous companies in accessing the Indian capital markets through IPOs (Initial Public Offerings), FPOs (Further Public Offerings), rights issues and QIPs (Qualified Institutional Placements). 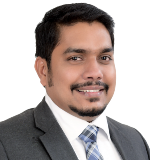 Souvik also has vast experience in employment laws and has assisted and advised many corporates and individuals with opinions relating to various aspects of employment laws, appearing before authorities, drafting of agreements, policies and assisting in various other aspects of employment law. He has also been closely associated with various sports management and celebrity management companies as a legal advisor and is currently concentrating on developing and building the Sports, Media and Entertainment law practice of ALMT Legal. On personal front, Souvik is an avid sports lover and closely follows Cricket, Football, Formula One and Lawn Tennis amongst many other sports. He is a cricket player himself, and is one of the founding members of the Justice League Cricket Club in Bangalore. He is also an avid traveller and a painter. During his free time, he loves to go for long drives, listen to music, read biographies or paint.